Platelets protect vascular integrity during inflammation. Recent evidence suggests that this action is independent of thrombus formation and requires the engagement of glycoprotein VI (GPVI), but it remains unclear how platelets prevent inflammatory bleeding. We investigated whether platelets and GPVI act primarily by preventing detrimental effects of neutrophils using models of immune complex (IC)-mediated inflammation in mice immunodepleted in platelets and/or neutrophils or deficient in GPVI. Depletion of neutrophils prevented bleeding in thrombocytopenic and GPVI(-/-) mice during IC-mediated dermatitis. GPVI deficiency did not modify neutrophil recruitment, which was reduced by thrombocytopenia. Neutrophil cytotoxic activities were reduced in thrombocytopenic and GPVI(-/-) mice during IC-mediated inflammation. 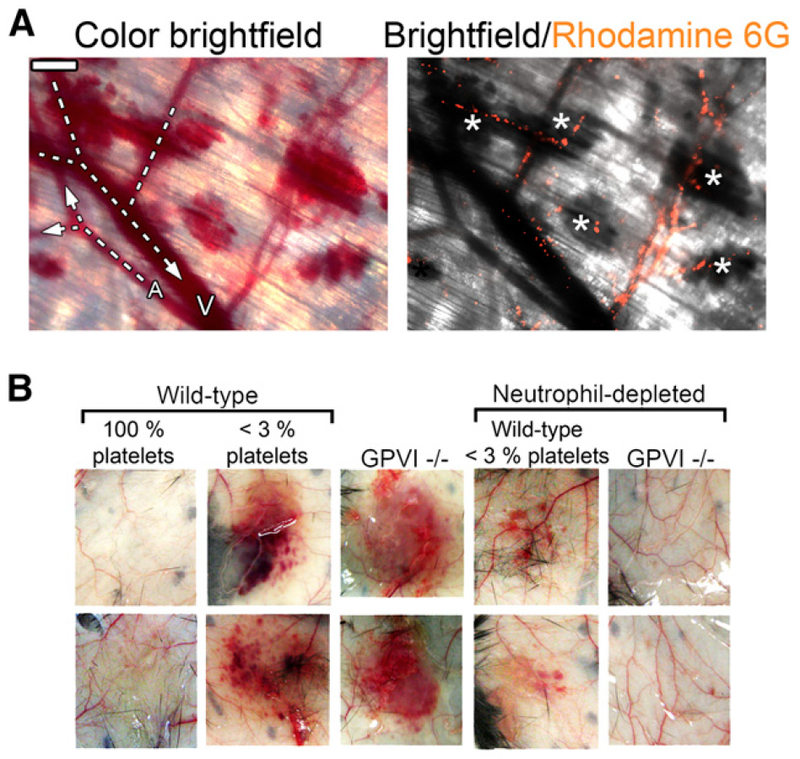 Intravital microscopy revealed that in this setting, intravascular binding sites for platelets were exposed by neutrophils, and GPVI supported the recruitment of individual platelets to these spots. Furthermore, the platelet secretory response accompanying IC-mediated inflammation was partly mediated by GPVI, and blocking of GPVI signaling impaired the vasculoprotective action of platelets. Together, our results show that GPVI plays a dual role in inflammation by enhancing neutrophil-damaging activities while supporting the activation and hemostatic adhesion of single platelets to neutrophil-induced vascular breaches.